Hoping that everyone can relax a little, here’s yesterday’s song that I couldn’t figure out how to post from my iPhone. We could use a little levity, I think. When I started writing this blog, it was with a sense of astonishment that the physicians treating the patients, Lyme and CFS, didn’t seem to recognize that they had a new quiver for their arrows. The few that did were quickly censured, or swore a few patients to secrecy. I had been housebound, sometimes bedbound, for years and never expected to return to work, so I didn’t care who I pissed off. Anything was better than the isolation. The good thing about not caring was that I learned to write authentically. During my 25 years in practice, I didn’t interface at all with the scientific community. Doctors only. I had no idea about the realities of this parallel universe that so impacts what clinical choices are open to us. I thought that the Science paper would be hailed as a great breakthough; scientists and doctors would come together, bringing different things to the table. The pace of progress would accelerate. If only that had happened! The scientists that I’ve criticized by name were Coffin, Stoye and Racaniello. The first two put themselves out there very early on in a way that appeared designed to stop progress. They also have a long history of publishing things together that minimized the risk, so aren’t clean on the issue and their opinions shouldn’t carry much weight. Dr. Coffin also took it upon himself to try to limit treatment options, my pet peeve. Professor Racaniello is a media figure, so fair game. I admit to being influenced by hurt feelings in his case, because I wrote to him when I started arv’s, in the midst of the first blush of excitement, wanting to have a discussion with him about the science and he shut me down, much the way Jason did. And to me, the tee-shirt still seems over the top thoughtless, though I think now that he probably didn’t understand what he was doing. There are signs that he is growing, e.g. publishing Dave Tuller’s important piece on his blog. I was angry at Dr. Singh when she published her negative paper, for the reasons I expressed back then, but essentially the same thing again; scientists trying to call the clinical shots, though in this case I understand that she felt that her former paper was too strongly in favor. I sent her testimonials from patients improving on arv’s at that time. My understanding from Dr. Enlander is that she is back on the case. I thought her a lovely person when I met her and I am glad she is again working on our behalf. The Mt. Sinai initiative is very exciting. It is difficult not to fantasize about Dr.’s Shadt and Lipkin putting their heads together. And Jason. Sorry Jason, I didn’t mean to hurt your feelings. I hope you learned something from our scuffle. No hard feelings on my end. Believe it or not, there are scientists that share with me, and I protect their privacy. I swear I’ll disavow knowledge of our friendship to my dying day if that’s what any scientist willing to share wants. At risk of scaring off the people we want to be here, there is a tracker on the blog, that allows me to see the IP address, location and the name of the server that loads each blog page, as well as how many prior visits from that address. Institutional servers give the name of the institution. There are at least a dozen readers at the NCI and another dozen who connect from NIH servers in a few different cities. A couple at the CDC in Atlanta. Readers at many universities and teaching hospitals, including a few at Columbia and Harvard. Cancer institutes around the country. Only a few of these people participate in the discussion. This is a potentially powerful thing. When I worked for the WPI, one of things I most wanted to do was establish lines of communication between physicians and scientists with all kinds of points of view. There is little to be learned from consensus when the truth isn’t even on the table. If there is a way to salvage some part of that dream, I’d like to. Many of the scientists came to read about Dr. Mikovits’ travails, but I am asking them to think about the science with us. In particular, I’d like to know your reactions to Dr. Snyderman’s data. Please adopt a handle and share with us. Your secret is safe with me. I ask you for the sake of the patients that you are now beginning to know, be bold. I realize that you are constrained by the knowledge that a patient community can do what we did, but there are 17 million patients worldwide in the ME/CFS cohort alone, who need creative thinking from you. There is every indication that our disease is reversible until it is very advanced. The unclaimed talent in the patient community is staggering, if only the disease could be calmed, not even cured. Look at me. I am productive after years of being almost unable to care for myself, let alone anyone else. I would like to put an end to the discussion about the lab science in the Science paper, the WPI, VIP Dx. Nobody knows the answers, including the protagonists. I certainly have no basis for evaluating any of it. I defer to the scientific community to figure it out; discussing it here is not productive. At this point, it is non-contributory and boring. Take it someplace else. This is also not the place to argue about whether Dr. Mikovits should be canonized or not, though she is my friend, and I am very sorry for what is happening to her. But from a clinical point of view it is irrelevant. This blog is about developing a model for treatment and how to best live with the disease. Thank you to our mold warriors for giving it another shot here, and for keeping it appropriate this time. I for one, think that your experiences of improvement without medication are significant. I also understand why you feel the need to tell others in the hope of reducing their suffering, as well as your frustration when you feel you aren’t being heard. I have been interested in Ritchie Shoemaker’s pioneering work, since 2002 when we shared a couple of patients with Ciguatera poisoning. And a big thank you to In Vitro Infidelium for the considered comment this morning. No invective or politics at all. Just a reply about the scientific discussion at hand. It was a breath of fresh air. Thank you for the excellent paper by Voisset et al. The quote you lifted in your comment is precisely the point. Although it clearly isn’t a simple, straight forward infection, there is epidemiological evidence that it is an emerging disease of very great proportions, not a stable situation. AIDS isn’t simple and straightforward either, without a test, in that infected people can remain apparently healthy for a long time, or even indefinitely. Only a small percentage of people with HTLV ever become clinically ill from it. Inbred sick mice don’t get sick from their MLV’s, but wild mice and some other rodents can. All I am asking for is that it be studied, not shut down if this attempt fails. Also, that our therapeutic options not be limited by how slow the science will be to unfold, even in a best case scenario in which Dr. Lipkin finds something. My hat is off to Dr. Lipkin. His finely worded communication to the patient community brought tears to my eyes. The only thing I would take exception with at all was the use of the word definitive. If by some quirk of fate, this study is completely negative, we beg you, use those specimens to take the next step. We are driving from Dallas to Santa Fe today, so I have only an iPhone to write on. I started this as a comment to respond to In Vitro, but got carried away. It is off the cuff and there are unsubstantiated statements (and probably typos), so I anticipate critcism. Yes, this is loose. I am ever hopeful of a meaningful discussion between scientists, doctors and patients, so I tolerate all the ugliness in the comments. I have no interest in or time for moderating the comments on this blog. I wish the more annoying elements, nasty and repetitive, would cease and desist. Say it once or twice, not twelve or fifty times. It isn’t any smarter after repetition. And I don’t understand the need for disrespect and reactions verging on paranoia. There are lots of smart people reading. If we could engage that talent for the greater benefit, we might get somewhere. In the paper under discussion, the group from Sardinia seemed to think they were dealing with “virions” and that they could reliably measure viral load. I am on an iPhone so can’t cite chapter and verse. There are more clues in the references from that same paper. That work was done years ago already. Not replicated or retracted. No dismissal as contamination. Just nothing. I guess MS doesn’t rate all that much better than we do. The lack of curiosity on the part of a small community of scientists sitting on top of a powder keg is disturbing and difficult to explain. I do not, and will not read ERV’s blog, so please do not reference it. She wrote about me a long time ago in a way that made it clear that she is not only narrow minded, but completely lacking in compassion, as are many of the characters in this movie. No credibility as far as I am concerned. So if there is something you would like me to read, please give me the papers, not some graduate student’s interpretation. So far, I’ve seen nothing to suggest that I’m wrong about anything of substance. I keep waiting for somebody to make me think harder. Do you have something better than, it isn’t true, because it isn’t in the literature? Do you have a better theory? As for gender disparities, the fact that more women are diagnosed with CFS and there are more males with ASD is not incompatible with their being related infectious diseases; the male brain may be susceptible earlier in life. Females are apparently more susceptible at puberty, post-partum and during perimenopause. All broad trends; male and female individuals can get sick at all ages. Vaccines implicated quite often (both live attenuated and killed), in both ASD and CFS, but not consistently, like everything that has been looked at. The work of Andrew Mason on a beta retrovirus associated with Primary Biliary Cirrhosis and an antimitochondrial antibody suggests overlap with our disease. A mitochondrial defect is implicated in the pathogenesis of Parkinson’s Disease and mtDNA mutations may be involved. One of the autoimmune markers that shows up commonly in ME/CFS is anticardiolipins; the inside of the mitochondrial membrane is rich in cardiolipins, a phospholipid common to mitochondria and bacterial membranes. If anyone would look at the epidemiology in a big way, I suspect a pattern of maternal inheritance will show. Lots of reasons to study our mitochondria. Looking for it is a mess, because it is a mess. It isn’t one thing. Lots of sequences recombining with lots of other sequences. Some replicative, some not. One group looks a bit different than another, but with notable similarities. Members of family groups can have symptom clusters that resemble each other but are distinct from symptoms of other family groups. I predict that it will not be as neat as the work on MSRV. Virus, genetics, injury. We are the canaries. The tip of the iceberg. If it wasn’t so sad, it’d be funny. Here is a paper from almost 30 years ago that says that a replication defective ERV can be rescued by mixing it up in culture with primate cells: Maturation of murine leukemia virus env proteins in the absence of other viral proteins. Schultz, derived from this work: Molecular properties of a gag- pol- env+ murine leukemia virus from cultured AKR lymphoma cells. Rein. What a concept! Rescuable incompetent ERV’s. They knew about it in the early 80’s, and knew that there were infectious animal retroviruses in vaccines, but decided not to worry about it. And why can’t these parenterally administered xenotropic and polytropic viruses infect humans? “Because they can’t”. “They are inactivated by human serum.” Now that certainly is sound scientific reasoning. And they accuse patients of poor scientific discourse? Scientists please, take your blinders off. There is a whole generation in which 1 in 100 is autistic. Dr. Anon, PhD thinks I should do nothing for the next 10 years while I, my daughter and my patients deteriorate. We should all just wait while a bunch of jokers at the CDC try to figure out what the questions are. I know what the questions are. Anyone with critical thinking skills that has actually read what I have written on this blog (including the references) should know what the questions are. Whether or not one particular xenotropic MLV exists in humans or not is now quite besides the point. Not finding MLV’s in 8 vaccines that never came near a mouse cell doesn’t support the safety of anything. Even Switzer et al suggest that maybe they should look at batches of old vaccines, though my understanding is that they were mostly used up in the search for the origin of HIV. They also seem to think that maybe the monoclonal antibody folks should take a closer look into their products, e.g. rituximab, produced via an intentional fusion of mouse and human. They’ve been doing this since the ’70’s. Fooling Mother Nature. Would one of the scientists reading like to explain to us exactly how this is done? The literature is confusing. But Dr. Anon, PhD, reading my blog, wants to “puke” because I am taking properly prescribed drugs for an off label indication? What a world! Tenofovir is prescribed for chronic Hepatitis B. Does that make you want to puke? We have non-HIV, non-HTLV AIDS, exactly analogous to non-A, non-B hepatitis before C was isolated. Wikipedia article: Off-label Use. The off-label prescribing of existing arv’s is completely legal. The only reason to prohibit it is because of the enormous financial implications if it works. Only a very few people have tried it. No disasters yet attributable to it, unlike most of the pharmaceutical alternatives; and to the scientists reading, you wouldn’t believe the dangerous crap my patients come to me taking, in combinations that have no research at all behind them to tell us about possible interactions. In my case, the only adverse effect of my experiment with arv’s that I can point to is that my straight hair became curly; this happens occasionally with chemotherapy and other drugs. Tenofovir treats Hepatitis B. Raltegravir inhibits Herpesviruses. AZT has been noted to impact Sjogren’s, which seems to be overrepresented in our patient group. Protease inhibitors kill some parasites. I referenced a paper in the last blog in which it was reported that HAART brought about an impressive remission in a patient with advanced MS (and some of us, myself included, have MS light). Those “confounders” are good things about the drugs in clinical practice; all drugs have good things and bad things about them for a given individual. As a clinician, I love it when a drug hits two things in a patient, making it more likely that the cost/benefit ratio for that drug will be favorable for that person. However, the idea that my response to arv’s is because they controlled my Herpesviruses is almost as ludicrous as the idea that Dr. Snyderman’s cancer cells went down because of a placebo effect. Twice. This seems like a good time to note that I have never had mono and am serologically negative for EBV. Since I was an ER doctor for 16 years and exposed to lots of mono, my body must be pretty good at keeping invaders out. Ali’s EBV tests are consistent with prior infection, and we both have low titer IgG for HHV-6, like almost everybody. There is really nothing to suggest that we have activated Herpesviruses as part of our picture, opportunistically or otherwise. Ali falls squarely into the Lyme group, not the activated virus group, and opportunistic infectious are not really a part of my clinical picture at all. I catch almost nothing. It’s the inflammatory effect of the physiological changes caused by the persistent immune shift to fight viruses so effectively that creates the subjective illness. Patients, and doctors, often confuse the symptoms of persistent inflammation with an active infection that needs to be killed or treated. There is also a subset of patients that catches everything and has ongoing problems with activated viruses. I have heard from people who have had mono and shingles numerous times. Most novel uses of existing drugs are figured out serendipitously. Somebody with two things takes a drug for one thing and the other thing gets better. Occasionally, somebody actually connects some dots and tries something on purpose. If it gets reported, it is called a case study. In a sane world it would be followed with an open label trial and then a double blind placebo controlled study. In response to the criticism that I’ve lead thousands of innocent patients down the garden path, please read what I’ve written, before jumping to conclusions. I have never said anyone should take arv’s. My point is that it should not be prohibited, and most definitely, the decision should not be in the hands of a bunch of lab scientists that have never treated a patient. A retrovirologist has no basis for an opinion about treatment at all. That they would presume to comment is a sign of disordered thinking right there. As I have said all along, ours was never a good experiment. What I have reported here is strictly clinical medicine. We were on an uphill course for about six months before starting arv’s, after quitting Lyme treatment. I do think that antibiotics were making us worse and when we stopped them, we went uphill, though an LLMD might say our treatment had worked:). I believe that arv’s helped us, though incompletely, not surprising for patients that have been sick for many years, who most likely have a high proviral load that continues to replicate mitotically. We still seem to be doing better than might be expected, but I have no way of knowing how we would be at this moment had we never taken them. The only marker we had to follow, TGF beta-1, initially very high has normalized for both of us over a year and a half (see numbers posted here; the pending results from 11/30 were normal TGF beta-1 and elevated C4a, for both of us). It is a very bad disease and we both feel lucky that our suffering is reduced. I wish that the science was keeping up so that we might have a better way of monitoring our therapy. We need a viral load measure or RT assay to follow, understanding full well that we might have more than one virus each and replication incompetent contributors. My biggest concern is the possibility of viral resistance, not toxicity of the drugs. As far as the arv elist is concerned, I try to create a safe place for patients taking arv’s to discuss their experiences. Occasionally, I answer a question, but mostly, it is patients talking to patients. Everyone on the list, thirty or so of them, decided to take arv’s on their own, and all have their own prescribing doctors, except for a few that live outside of the US. In my practice, since I am willing to prescribe arv’s for an extremely informed patient, I must not be pushing it very hard, since none of my private patients have yet swallowed an arv. Unfortunately, it is still the patients least likely to respond who are trying it, people who have been sick for a very long time with advanced disease that feel like they have nothing to lose. Much scarier to contemplate, but with a much greater possible upside, is the question of what would happen if newly crashed ME/CFS or ASD patients were treated quickly after onset of symptoms. This obviously needs to be investigated, but in a controlled setting. It will be very expensive to do safely, so is unlikely to happen for either of these conditions (cancer more likely). People don’t like to be wrong and there are lots of wrong, powerful people in this story. My husband has been acting CFSy lately. When his symptoms flare, I am always impressed that it must be an infectious disease. All four members of my nuclear family have certain common symptoms, e.g. painless ocular migraine, which was a rare condition when I was an ER doctor 17 years ago, and orthostatic intolerance, of a form that nobody had ever heard of a few decades ago. Vascular instability and autonomic neuropathy in four members of a nuclear family, two sick, two not. Husband and wife not even distantly related. I thank God every day that my son isn’t autistic. I vaccinated him selectively, for the wrong reasons, but I have heard from that woman out there who, like me, has CFS and a CFS daughter, plus an autistic son. Is it because I didn’t give him the Hep B vaccine (which is not a live vaccine, but causes persistent immune activation over a long period of time)? I get letters now and then suggesting that I do not know how horrible polio and other infectious diseases were before vaccines. That isn’t true, I do know. But just because the vaccine program saved many people doesn’t mean that we shouldn’t look at problems that may have been caused by it, and modify our recommendations now for people at high risk, e.g. people with CFS and new offspring of ME/CFS women. We desperately need extensive epidemiological studies to find out what happened when. If you want to look at the bigger evolutionary picture, we have changed nature’s culling process. If you take the starfish parable from a few blogs back to it’s natural conclusion, throwing the starfish back is a mistake, because they are vicious predators that overbreed and damage the reef. In the meantime, the backlash from the flash of illumination has started. The Mayo Clinic says SSRI’s (which many ME/CFS patients don’t tolerate), sleep meds, GET and ‘therapy’ are what we can have as far as treatment goes. That’s the best they can do for a million sick people? On their website: “More than 3,300 physicians, scientists and researchers from Mayo Clinic share their expertise to empower you to manage your health.” Shame on them. May the doctors that came up with this page never have to get sick, or have their child get sick, with a horrible debilitating disease and be faced with such options. May they find some shred of compassion in their hearts of stone before that fate can befall them. I am writing to you today from the Louisiana bayou. My husband’s 50th birthday present a couple of months ago was our first RV, and this is our first trip. We have always wanted to try the RV lifestyle, but now even more so, since we love to be in nature and it is the only way that I can still travel comfortably. Our son was just accepted to Tulane with a big scholarship, so we decided to take him to New Orleans to help him decide what he wants to do. Ali didn’t come on this trip, but will come on the next one, shorter and closer to home. The trip has been exciting, to say the least. We survived the worst blizzard in 40 years in north Texas and a tornado warning in southern Louisiana. I love the spontaneity and limitless possibility of seeing the world this way. Change is usually so difficult with this illness, but everything I need is close at hand and comes with us when we move. The pendulum of my disease continues to swing, as always, while I practice the art of transcending symptoms, living as many full moments as I can. Right now, my husband and son are fishing in the rain. We’ve had the worst luck with weather. Adversity is giving us all the opportunity to practice acceptance and work on our interactions in a close space. Like life, the difficulties have been punctuated by amazing moments; yesterday we watched from our canoe as a small otter caught and fought a huge fish, then defended it from a Great Blue Heron. This part of the country is very wild and alive. When I couldn’t sleep for a while last night, I listened to wonderful, unfamiliar night noises. And the breaking news? Lo et al just retracted, saying the work was perfect, but the conclusion must be wrong, since nobody has replicated it yet, except for one other lab. Therefore, enough money wasted. Now there’s some ironclad logic for you. So here we are, two years after the scientific community was told which rock to look under, still arguing about whether two or three scientists can reproduce their work or not. In the meantime, a promising avenue of treatment, antiretrovirals, has been shut down like a prohibition, for the flimsiest of reasons. Too dangerous (compared to what?). Too expensive (for whom?). AIDS patients need their drugs (since they have a serious illness). How can we treat it if we don’t know the precise agent we are treating? The way doctors treat people every day. Best guess. I actually think we have a better model than the rheumatologists are using to prescribe incredibly toxic drugs for patients with autoimmune diseases. AIDS patients have to be treated forever, but we don’t have any idea if that is true for us or not. Just think how much we’d know now if part of the money that was spent trying to find a virus that doesn’t exist in nature could have been spent on very simple clinical trials of safe, existing drugs. It is becoming clear that at least some are concerned about lab contamination by viruses that are very good at infecting human cells in vitro. See Zhang and Sfanos on the side bar. It’s about time somebody worried. Whatever works, and fear is a good motivator. It worked for HIV. Here are a few excellent papers that have helped me to refine my working model, though I don’t like it that it is going towards greater complexity, since I like grand unifying theories. But the level of complexity of the problem is intersecting with the state of the art. Cutting edge sequencing and analytics are required. Friendly viruses: the special relationship between endogenous retroviruses and their host. Varela. Defective sequences can be reconstituted by new incoming. It is not as simple as one sequence or one virus, or even five strains of one virus. Lots of viruses and pieces of viruses. Lots and lots of exposures, if it came from vaccines, grown in all kinds of cells, murine and avian, administered parenterally to most of the human race for decades, and subject to recombination. There were clearly waves when people got sick, but those may have been recombination events, when some necessary piece was supplied to reconstitute something that was there already. Or maybe there were waves of helper viruses that went out and turned on what was there. Or particular environmental toxins that activated one from an earlier invasion (from the Weiss paper above: “..we were able to show that treatment of normal chicken cells with a variety of activating agents such as ionizing radiation or carcinogens stimulated release of virus..”). This was probably part of the problem too; endless selective breeding of sick mice that produce retroviruses that they are resistant to, but the cells of other species may not be, hence putting lab workers at risk, especially those working directly with tissue culture and xenografts. The Mouse Trap: The dangers of using one lab animal to study every disease. Engber. The younger women I am seeing, and who have written to me, often have symptoms consistent with PCOS (polycystic ovary syndrome). The few I have tested in my practice, have laboratory evidence of LH insensitivity, LH/FSH ratio greater than 2 in a menstruating woman with normal FSH. LH insensitivity interferes with the egg being released from the developing follicular cyst, so the corpus luteum doesn’t form properly, progesterone isn’t made normally, and estrogen dominance, with all its problems, ensues. The condition is also characterized by high androgens and a dysmetabolic syndrome causing central body fat distribution. Does progesterone deficiency favor the virus? Physiologic replacement is a powerful therapeutic option for women so affected. PCOS is a very common cause of reduced fertility, so if germline retroviral infection is involved, it isn’t a very good strategy for a virus that is not spread horizontally. However from an evolutionary perspective, if the virus succeeds in most of its hosts, the few that become infertile and are a dead end, are just part of the evolutionary process. Remember that only a very small percentage of HTLV patients ever get sick and genetic factors are probably key. Env proteins are strongly implicated in the neuropathogenicity of MLV’s, and also recognized in the evolving retroviral model of RRMS (relapsing remitting multiple sclerosis). Could antiretroviral drugs be effective in multiple sclerosis? A case report. Maruszak: This is a letter to the editor behind a paywall, but documents the resolution of significant neurologic impairments, including bladder and bowel incontinence, in an MS patient after being treated with HAART for HIV infection. The patient developed MS and was infected with HIV in ’85. He was treated with HAART in ’96, improved rapidly with resolution of many MS symptoms, including fatigue, within two years. It happened in the late ’90’s and it was just published… It is the only paper I could find where anyone has documented an effect of arv’s on MS, despite the fact a retrovirus has been suspected for over a decade. How’s that for blinders! What is it about this particular class of drugs that has everybody so spooked? Is it because AIDS patients have to take them forever? It may not be the case here. The best anecdote I’ve heard was 16, only sick for 8 months, responded quickly, stopped treatment after 6 months and has stayed well, as far as I know. And even if the drugs are for good, they are very clean drugs. HIV infected people have gotten very good research into their disease. The literature suggests that the search for a sensitive enough reverse transcriptase assay was abandoned for HIV, as specific testing became highly sensitive. However, if you were looking for generic replication competent retroviruses that you could monitor, a clinically useful RT assay would seem to be indispensable. RT assays have been used in the lab since the late ’60’s, but seem to have been abandoned more recently, except for research purposes involving monitoring of retroviral vectors. Maybe one of the scientists reading can explain why this test isn’t clinically available? Why wouldn’t it be useful for MS, for example, given the suggestions of the papers above concerning that disease? Maybe some money to be made here, for any diagnostic test patent seekers who might be reading. Ultrasensitive retrovirus detection by a reverse transcriptase assay based on product enhancement. Pyra. Ali remains on Viread/Isentress and continues to be surprised by greater than expected resilience, e.g. rapidly recovering from having her wisdom teeth extracted. I came off Isentress a couple of months ago and didn’t notice much of anything. It didn’t seem a good idea to stay on monotherapy and someone already committed to the experiment needs to give a protease inhibitor a try; therefore, I started Lexiva two weeks ago. There was a recent paper showing that amprenavir inhibits XMRV in vitro (Li/Wlodawer on the side bar), but also, there are several clues in the literature that suggest that it might inhibit MLV proteases more broadly. HIV treatment wasn’t truly effective until PI’s were added. The first time I tried Lexiva, as a fourth drug then, still using an HIV model of HAART, it had the unexpected effect of CNS activation and it is doing that again. I describe it as “turning up the volume”, a perceptual shift. I am more reactive, but that is dying down now. It doesn’t do this with AIDS patients and I have no explanation, other than it moves the disease in some way, since I don’t see how it is an adverse effect of the drug. The other arv’s shook things up for me for a while too, but that felt like an inflammatory flare of usual symptoms. Physically, I think I feel a bit better, stronger in the last few days, but it could well be the swing of the pendulum. I will stay the course and report. I’m writing to you in the hope that by sharing a little of my medical history I can help. If XMRV is totally out of the picture it must in my case be a related retro-virus. I think if there were a place to pool ME/CFS patient information there might be something made obvious through comparative analysis. I started on AZT about a year and a half ago On 3/6/10, my health seemed to gradually improve, by december I developed pain on the inside of both legs so at the end of december I stopped taking AZT. I declined rapidly and by the first of February I was worse than before I started on AZT. A few days into February I started taking Viread and Isentress and felt even worse for the next 10 days to two weeks (which I had read to expect this) I actually kept busy just to take my mind off how bad I felt. Gradually I started to feel better and by the end of May of this year I thought I was well on my way to a normal existence. I think it was July and September I declined. Today I am definitely better than when I started but still far from my goal. I don’t want to stop taking anti-retrovirals. I’m wondering if I would have done better if I had included Emtricitabine and if I should start now. I will discuss it with my doctor. If a yet unknown retrovirus is the culprit, it’s anybody’s guess as to which drugs are most effective. I think the best course of action would be to find the cohort who have responded to the three above mentioned drugs and divide them into groups to see how they respond to other (additional) anti-retrovirals. I think everyone affected would be perfectly okay with finding the treatment before finding the cause. Even if it’s a small subset of patients, we will have chipped away a little at this stumbling block we call ME/CFS. I have had this for 18 and 1/2 years and I’m about to turn 64. So like everyone else I want answers now. Sick patients trying to figure it out on their own, the ultimate failure of an ineffectual system. Scientists not only don’t talk to patients or doctors, they don’t even talk to each other, since somebody might steal their ideas. All closeted, each guy alone in a lab looking at a little piece of the elephant, writing in notebooks with pens?!! No copies? It seems even more dysfunctional than our broken medical system, that a dispute between a scientist and their employer can result in the hopes of an entire patient community being dashed on the shoals of intellectual property law and the criminal justice system. I would like to thank Dr. Lipkin for being the voice of reason in an insane situation. He is positioned to help us. I hope he stays interested in our plight. We have very few friends, but maybe one new one who has the wherewithall to crack the case. I have updated my ongoing one person anti-retroviral treatment study of a patient with chronic lymphocytic leukemia and CFS. I have been on this treatment since 5/27/10. My first response to AZT and raltegravir lasted through March 7, 2011, 9.4 months. I collected relapse data until July to make sure I had enough parameters. 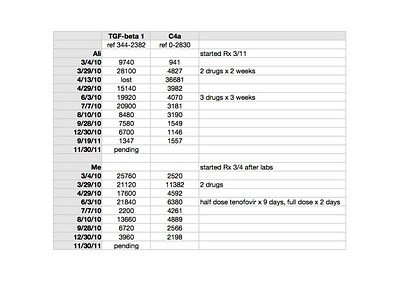 I added tenofovir 7/18/11. My leukemia cell counts are about 25% of what I would have projected them to be by now. My last set of blood work was done December 12, 2011 although only the total lymphocyte count has returned, other parameters pending. It is now 4.5 months since I have added tenofovir. Before I started ARVs I was ill enough with the CFS that I thought I would have to retire. Since, I am not perfect, but I am improved and am functional, 17.8 months since I took my first dose. I agree that XMRV is not the pathogen but indeed my results show that a retrovirus is part of the etiology of both the leukemia and the CFS. It is a one-person study, but my leukemia and CFS are quite typical and there is nothing at all unusual to suggest the results do not give an insight as to what is happening with us. The paper will be submitted for publication when my integration studies are available, hopefully in the next couple of months. I will add a title, abstract and methods at that point. My conclusion is that further research is clearly indicated and it would be very reasonable to have the government fund this research. As an oncologist, I understand the value or lack of value of all standard treatment options for Chronic Lymphocytic Leukemia. I am not seeking reimbursement for the treatment from a third party payer and am not using illegal drugs. There is no associated financial gain. Of the many anti-cancer agents developed over the last 50 years none has toxicity totally selective against cancer, toxicity is never seen in just the cancer. There was no toxicity associated with my treatment. There are no clinical studies claiming single-agent chemotherapy activity for AZT, raltegravir or tenofovir. The response of my leukemic cells within 4 weeks is too soon for depletion of telomeres and induction of apoptosis. The anti-telomerase compound imetelstat (GRN 163lL) has not shown single-agent activity in clinical trials and is thought at best to be a cytostatic compound. DNA assays on my plasma for EBV and CMV DNA were negative. My lymphocytes were tested for active EBV infection at Mayo Clinic and were negative. A screening for active herpesvirus infection with CMV, EBV and HHV6 was negative at the WPI. The results of the absolute lymphocyte count are on file at the Catholic Hospital System of Western NY and the other parameters are on file at Quest. I will give permission for anyone who wishes to get copies directly. Furthermore, as I am guided by the results to determine my treatment which in turn determines my health and survival, I want the results to be correct. Because of medical-legal concerns, a physician treating himself is the best starting point. My CFS and CLL are typical and the positive results indicate that further study is important and also give a rational starting place for a treatment protocol. In the 1970’s three independent laboratories reported the presence of a MLRV in sarcoma, leukemia and various lymphomas [1-6]. The MLRV was found only in neoplastic and not in normal cells and was similar to the Rauscher virus. The most recent nomenclature calls this type of virus an HGRV. Surprisingly, the 1970’s body of work was largely ignored for the next thirty years until 2006 when Urisman et al  reported a HGRV/MLRV which they named XMRV in some prostate cancer. In 2009, Lombardi et al  at the Whittemore Peterson Institute (WPI) found evidence of infection with HGRV/MLRVs similar to XMRV in most patients with the Chronic Fatigue Syndrome (CFS). At present, the Lombardi et al viral findings have been criticized because many laboratories have not been able to reproduce their results. Some retrovirologists have said unequivocally that HGRV/MLRVs do not cause CFS. The diagnosis of CFS is objectified by using the Canadian Criteria for diagnosis of CFS and by demonstrating a typical elevation of cytokines and chemokines . CFS patients are suspected to have an increased incidence of lymphoid malignancy and brain tumors compared to the normal population . The implication of this is that HGRV/MLRVs may be etiological for both CFS and malignancy. Daniel Peterson’s CFS practice consisted of 300 patients from the 1984 Nevada CFS epidemic. Thirteen patients from this cohort developed various B-cell lymphoproliferative disorders and all that were tested were positive for a T-cell clonal expansion. They were also found to have evidence of infection with HGRV/MLRV at the WPI but this latter data is now in limbo. It was hypothesized that a HGRV/MLRV infection was responsible for the T-cell clonal expansion and that this clonal T-cell expansion might have promoted the development of CFS and malignancy. A patient with B-cell CLL tested positive for antibodies to MLRV proteins. Integration studies are pending. Although not previously diagnosed as having CFS, his symptoms fulfilled the Canadian Criteria for diagnosis of CFS. His elevated cytokine and chemokine levels were consistent with the diagnosis of CFS. He was also positive for a clonal T-cell expansion by both quantitative and qualitative assays for the presence of a clonal TCRg gene rearrangement. He had average prognostic factors with the only potential adverse factor being a trisomy 12 clone. His testing for EBV, CMV, HHV6A and HHV6B was negative. He started treatment with AZT and raltegravir 571 days after diagnosis of CLL. 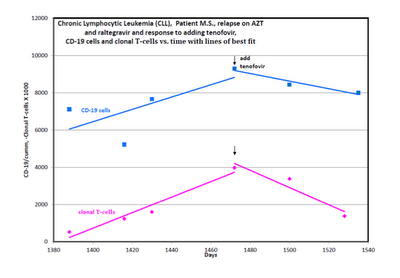 By day 56 of treatment, his cytokine levels had improved (Figure 1). This coincided with improvement in symptoms of CFS which included fatigue, difficulty in concentration and neuropathic pain. His response continued for 9.4 months with no associated toxicity and he was able to work full time. His previously increasing absolute lymphocyte count (ALC), CD 19 cells and trisomy 12 cells trended downward during this period of time. 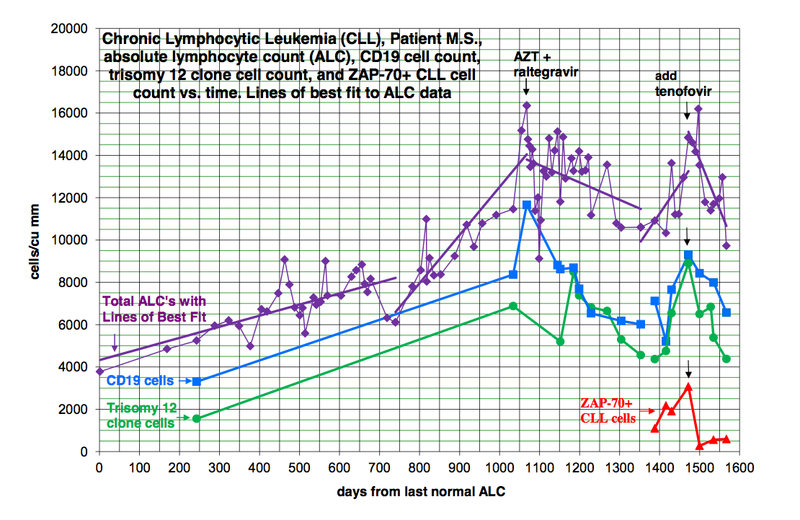 At the start of treatment with AZT and raltegravir, his ALC was 16,348/cu mm and CD 19 cells 11,658/cu mm up from 3,303 at diagnosis. His trisomy 12 cells peaked at 8,490/cu mm day 117 of treatment up from 1,550 at diagnosis. After 285 days of treatment his ALC was down to 10,600/cu mm, CD 19 cells down to 6,015 and trisomy 12 down to 4,558. Subsequently, his counts relapsed despite continuation of AZT and raltegravir. Symptoms of CFS also worsened. Tenofovir was added and all parameters trended down again and symptoms of CFS improved (Figure 2). 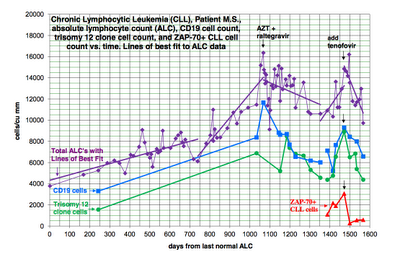 The ALC peaked at 16,194 at week 3 of treatment and by week 20 was down to 12,324. The baseline CD-19 count was 9,298, trisomy 12 cell count was 8,902 and the ZAP70 count was 3,068. By week 13 the CD-19 count was down to 6,570, the trisomy 12 count was down to 4,374 and the ZAP70 count was down to 591. Week 20 values of these last three parameters are pending. 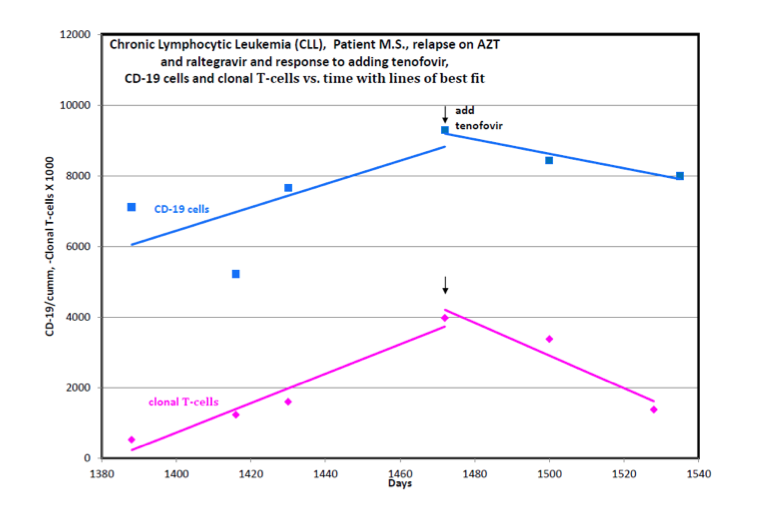 Quantitative data for clonal T-cells became available at the time of relapse and showed a rise in clonal T-cells that appeared to be more rapid than the increase in the CD-19 cells and after the addition of tenofovir both the clonal T-cells and the CD-19 cells trended down but the clonal T-cells appeared to decrease more rapidly (Figure 3). 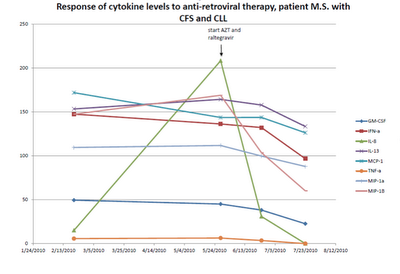 The development of B-cell lymphoid malignancies in 13 of 300 CFS patients suggests that CFS patients are at a several hundred fold increased risk for malignancy compared to generally quoted incidences for the general population. Of these 13 patients, all were positive for a clonal T-cell expansion. They were also positive for evidence of infection with HGRV/MLRVs but this data is now in question. The greatly increased risk for B-cell malignancy in a potentially HGRV/MLRV infected population may be due to infection of the B-cell line by the HGRV/MLRVs. Retroviruses have been thought to cause cancer by insertional mutagenesis. This mechanism requires that the retrovirus proviral DNA be integrated into host cell DNA next to a proto-oncogene thereby inducing activation of the proto-oncogene. A more important mechanism with MLRVs may be the ability of viral proteins to change host cell gene expression. Twenty-four to forty-eight hours after a permissive cell line is infected with XMRV, multiple cellular genes are expressed: “10 genes are implicated in cell morphology, 11 genes in cellular development, 12 genes in cell-to-cell signaling and interaction, 11 genes in cellular movement and 13 genes in cellular growth and proliferation” . Spadafaro has shown that reverse transcriptase can cause gene activation and lead to the malignant phenotype . In some retrovirus related cancers, Env  and Gag  may also be important in malignant transformation. The finding that XMRV did not cause malignant transformation de novo in tissue culture  would be irrelevant to the clinical reality of human cancer. It is accepted that multiple events are necessary to convert a cell line into a pre-neoplasm or a clinically important neoplasm. Human cancers have mutated genes and changes in gene expression that could make them permissive to infection by retroviruses. The retroviruses could induce further changes in gene expression that would make the infected cell line behave in a more malignant fashion. The corollary to this is that treatment that would block viral protein influence in a neoplastic cell line could make the neoplastic cell behave in a less malignant way. A complementary hypothesis is that infection by HGRV/MLRVs results in a T-cell clonal expansion. The clonal T-cells produce elevated cytokine and chemokine levels which may be partially responsible for the CFS. Furthermore these cytokines and chemokines may have a paracrine activity that would stimulate a simultaneous neoplasm to behave in a more aggressive fashion . One objection to considering HGRV/MLRVs to be pathogenic viruses is that there was previously no explanation as to how MLRVs could have entered the human population. However, early vaccines were prepared by passaging human virus through mice for the purposes of viral isolation and for attenuation. This would have allowed for contamination of vaccines with murine leukemia viruses . The original Yellow Fever Vaccine was made in the early 1930’s by culturing the virus in mouse cerebral tissue . Some patients received both the Yellow Fever virus and infected mouse cerebral tissue. The YF17D strain was used to immunize over 400 million people world-wide over the next 65 years . The U.S. Armed Forces started to vaccinate service men for Yellow Fever during WWII and continued thereafter as per the branch of service and deployment status . The polio vaccination trials in the United States started in 1952. The polio virus strains were initially serially transferred by Koprowski through many passages in mice, cotton rats and primates to achieve attenuation . Olitsky with whom Sabin had a long-term collaboration adapted the type 2 (Lansing) polio strain to mice  and the Sabin vaccine contained this strain. Indeed, the patient studied here, received the live oral polio vaccine in the early 1960s, ten years later developed symptoms of CFS and forty years later developed CLL. He also received the Yellow Fever vaccine in the early 1970’s on entering the Armed Services. In summary, a new patient with both CFS and B-cell CLL was identified. Infection with a HGRV/MLRV was suggested by the presence of antibodies to MLRV proteins. 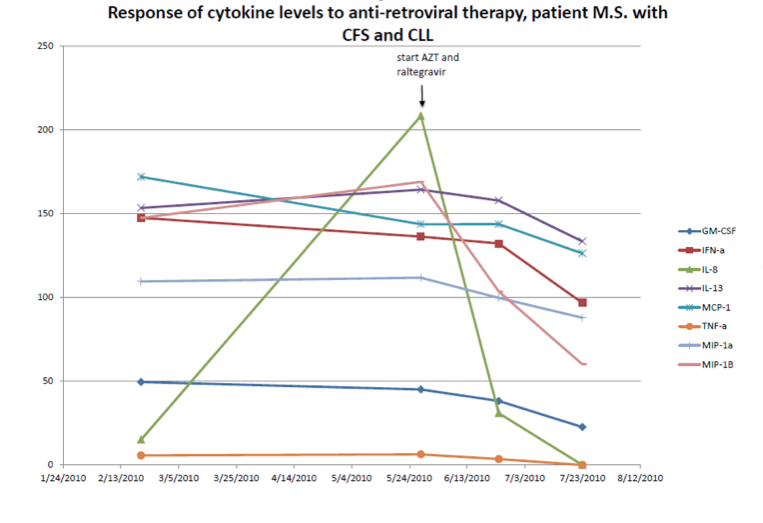 He also was positive for a T-cell clonal expansion and had elevated cytokine and chemokine levels typical of patients with CFS. With anti-retroviral therapy he showed improvement in his cytokine and chemokine levels, CFS symptoms and hematological parameters. Presumably his improvement was related to the anti-retroviral effects of treatment. The progressive improvement of his ALC, CD19 cells and trisomy 12 clone lasted 9.4 months. Despite continuation of AZT and raltegravir his leukemia relapsed. Interestingly, during relapse both the total B-cell count and the clonal T-cells increased with the rate of increase of the T-cells appearing more rapid. A second response was induced by the addition of the second reverse transcriptase inhibitor, tenofovir. Both the total lymphocyte count and the clonal T-cells fell with the rate of decrease of the clonal t-cells appearing more rapidly. At the time of this report the second response is ongoing at 14-20 weeks. These findings are consistent with the importance of reverse transcriptase in the behavior of the patient’s leukemia and CFS and the potential influence of the clonal T-cells on both these processes. It is possible that inhibiting reverse transcriptase decreased proliferation of both the T and B-cell clones or the effect might be primarily on the clonal T-cells. The rise and fall of cytokines we have documented would be proportional to the absolute number of the clonal T-cells and secondarily could influence the proliferation of the B-cell clone. Alternative explanations for the therapeutic effect of his anti-retroviral therapy have been considered. One of these is selective toxicity rather than an anti-retroviral effect. Selective toxicity has never before been seen with the hundreds of agents used as cancer therapeutics and seems an unlikely explanation for his improvement especially as the patient had no toxicity at all. AZT, raltegravir and tenofovir have never been shown to have single agent chemotherapy activity so a chemotherapy effect is unlikely to be an explanation. Anti-telomerase activity of the AZT has also been considered, but the rapid response to treatment does not fit the kinetics of depletion of telomeres and induction of apoptosis. Furthermore, an anti-telomerase agent did reach clinical trial and failed to induce remissions. Anti-herpesvirus activity of the antiretroviral regimen is not a tenable explanation of his response as an active herpesvirus infection was ruled out. There is nothing unique about this patient’s clinical presentation to suggest that his case is any way unrepresentative. His response to anti-retroviral therapy implies that HGRV/MLRVs were etiological for both his CFS and CLL and that anti-retroviral therapy might help other patients with CFS and HGRV/MLRV associated malignancy. Many more patients need to be studied. Ultimately questions that should be answered are what neoplasms are associated with HGRV/MLRVs, will existing anti-retroviral drugs have activity in these neoplasms, will other anti-retroviral drugs such as a protease inhibitor be required and what would be the optimal combination of anti-retroviral drugs. Kufe D, Hehlmann R, Spiegelman S: Human sarcomas contain RNA related to the RNA of a mouse leukemia virus. Science 1971, 175:182-185. Hehlmann R, Kufe D, Spiegelman S: RNA in human leukemic cells related to the RNA of a mouse leukemia virus. Proc. Nat. Acad. Sci. USA 1972, 69:435-439. Hehlmann R, Kufe D, Spiegelman S: Viral-related RNA in Hodgkins’ Disease and other human lymphomas. Proc. Nat. Acad. Sci. USA 1972, 69:1727-1731. Kufe D, McGrath IT, Ziegler JL, Spiegelman S: Burkitt’s tumors contain particles encapsulating RNA-instructed DNA polymerase and high molecular weight virus related RNA. Proc. Nat. Acad. Sci. USA 1973, 70:1737-741. Baxt WG: Sequences present in both human leukemic cell nuclear DNA and Rauscher Leukemia Virus. Proc. Nat. Acad. Sci. USA 1974, 71:2853-2857. Aulakh GS, Gallo RC: Rauscher-leukemia-virus-related sequences in human DNA: Presence in some tissues of some patients with hematopoietic neoplasias and absence in DNA from other tissues. Proc. Nati. Acad. Sci. USA 1977, 74:353-357. Urisman A, Molinaro RJ, Fischer N, Plummer SJ, Casey G, Klein EA, Malathi, K, Magi-Galluzzi C, Tubbs RR, Ganem D, Silverman RH, DeRisi JL: Identification of a novel gammaretrovirus in prostate tumors of patients homozygous for R462Q RNASEL variant. PLoS Pathog 2006, 2:e25. Lombardi VC, Ruscetti FW, Das Gupta J, Pfost MA, Hagen KS, Peterson DL, Ruscetti SK, Bagni RK, Petrow-Sadowski C, Gold B, Dean M, Silverman RH, Mikovits JA: Detection of an infectious retrovirus, XMRV, in blood cells of patients with Chronic Fatigue Syndrome. Science 2009, 585-589. Lombardi VC, Hagen KS, Hunter KW, Diamond JW, Smith-Gagen J, Yang W, Mikovits JA: Xenotropic Murine Leukemia Virus-related Virus-associated Chronic Fatigue Syndrome reveals a distinct inflammatory signature. In vivo 2011, 25: 307-314. Levine PH, Fears T R, Cummings P, Hoover RN: Cancer and a fatiguing illness in Northern Nevada-A causal hypothesis. AEP 1998, 8:245-249. Matutes E, Taylor GP, Cavenagh J, Pagliuca A, Bareford D, Domingo A, Hamblin M, Kelsey S, Mir N, Reilly JT: Interferon a and zidovudine therapy in adult T-cell leukaemia lymphoma: response and outcome in 15 patients. British J Hematology 2001, 113:779-784. Bazarbachi A, Ghez D, Lepelletier Y, Nasr R, de The H, El-Sabban ME, Hermine O: New therapeutic approaches for adult T-cell leukaemia. The Lancet Oncology 2004, 5:664-672. Melana SM, Holland JF, Pogo B G-T: Inhibition of cell growth and telomerase activity of breast cancer cells in vitro by 3’-Azido-3”-deoxythmidine. Clinical Cancer Research 1998, 4:693-696. Li H, Song T, Xu W, Yu Y, Xin X, Hu D: Effect of 3’-azido-3’-deoxythymidine (AZT) on telomerase activity and proliferation of HO-8910 cell line of ovarian cancer. Int J Biomed Sci 2005, 2:35-41. Singh IR, Gorzynski JE, Drobysheva D, Bassit L, Schinazi RF: Raltegravir is a potent inhibitor of XMRV, a virus implicated in prostate cancer and Chronic Fatigue Syndrome. PLoS Pathog 2010, 5:e9948. Paprotka T, Venkatachari NJ, Chaipan C, Burdick R, Delviks-Frankenberry KA, Hu W-S, Pathak VK: Inhibition of Xenotropic Murine Leukemia Virus-Related virus by APOBEC3 proteins and antiviral drugs. J of Virology 2010, 84:5719-5729. Lee M, Gusho E, Das Gupta J, Klein E, Silverman R: XMRV infection induces host genes that regulate inflammation and cellular physiology [abstract 280]. J Urology 2011, 185(suppl 4):e 113. Sciamanna I, Landriscina M, Pittoggi C, Quirino M, Mearelli C, Beraldi R, Mattei E, Serafino A, Cassano A, Sinibaldi-Vallebona P, Garaci E, Barone C, Spadafora C: Inhibition of endogenous reverse transcriptase antagonizes human tumor growth. Oncogene 2005, 24:3923–3931. Katz E, Lareef MH, Rassa JC, Grande SM, King LB, Russo J, Ross SR,MonJG: MMTV env encodes an ITAM responsible for transformation of mammary epithelial cells in three-dimensional culture. JEM 2005, 201:431-439. Swanson I, Jude BJ, Zhang AR, Pucker A, Smith ZE, Golovkina TV: Sequences within the gag gene of mouse mammary tumor virus needed for mammary gland cell transformation. J Virology 2006, 80:3215–3224. Metzger MJ, Holguin CJ, Mendoza R, Miller AD: The prostate cancer-associated human retrovirus XMRV lacks direct transforming activity but can induce low rates of transformation in cultured cells. J Virology 2010, 84: 1874-1880. Erdman S., Poutahidis T: Roles for Inflammation and Regulatory T Cells in Colon Cancer. Toxicologic Pathology, 2010, 38: 76-87, 2010.
van der Kuyl AC, Cornelissen M, Berkhout B: Of mice and men: on the origin of XMRV. Frontiers in Microbiology 2011, 1:1-7. Millitary vaccinations. Air Force Joint Instruction 48-110, Army Regulation 40-52, BUMEDINST 6230.15, CGCOMTINST M6230.4E, dated 12 May 2004. Koprowski H: Historical aspects of the development of live virus vaccine in poliomyelitis. Brit Med J 1960, 2:85-91. Casals J, Olitsky PK, Anslow RO: Adaption of a Lansing strain of poliomyelitis virus to newborn mice. JEM 1951, 94:111-121.